In the next few days, you might notice the hashtag “påskestemning” is trending on the social media accounts of your Norwegian friends. The literal translation of påskestemning is “Easter atmosphere”, or that “Easter feeling”. Win a Norwegian Easter egg from Study Bergen. We will draw two winners on Tuesday 23 April at 12:00 . The draw is only available for students and employees from Study Bergen's member institutions. That Easter feeling can obviously means different things for different people. In Norway however, you’ll probably find that many of the images hashtagged with “påskestemning” depict a snowy scene with a bright blue sky, skis, oranges and people sitting outside in the snow basking in sunshine. A typical Norwegian Easter holiday. So what is about Easter? For many there’s an optimism associated with Easter. It coincides with the start of Spring, and the end of the dark Winter nights. It’s that time of year when the warmth of the sun is noticeable again, so even high up in the mountains where there is still snow, you can sit outside and enjoy the sunshine. There are three public holidays in the Easter period in Norway (Maundy Thursday, Good Friday and Easter Monday). Additionally Wednesday in Easter week is half day. Schools break up for the Easter holiday on the Friday before Palm Sunday. Thus, many Norwegians will use a couple of holiday days, or take time off in lieu, and enjoy a full week of holiday. With all the public holidays at Easter, many Norwegians escape to the mountains. Even in the larger cities, like Bergen and Oslo things are pretty dead at Easter. You may find one or two fast food chains open, but shops will be closed, as will most restaurants and many bars. Bypåske – Easter in the City / Easter in the town. For those that don’t have a cottage, prefer to keep their distance from snow, or perhaps have to work. Bypåske has its own hashtag. In Bergen you’ll undoubtedly see lots of posts with bypåske from Vidden and byfjellene and from the city itself. Brustadbua – A grocery shop that is open when other shops have to be remain closed in accordance with Norwegian law. Regulations dictate the maximum area of a Brustadbua, and they are therefore small. These shops will be open at Easter, but the pickings will be slim. (Norwegians tend to stockpile anything and everything any time shops are closed for more than two days). Påskekrim – Easter Crime. This is a cultural thing. Norwegians LOVE their crime at Easter. You will find that Norwegian TV- channels such as NRK and TV2 show crime series, book shops will generally have offers on crime books, and newspapers and magazines will have written their own cimestories. Påskenøtter – The direct translation is Easter nuts. You may very well find a snack company that has adopted this on their Easter packaging, but the correct translation would be an Easter quiz. Påskeegg – Easter egg. You don’t generally find chocolate eggs covered in plastic and lots of cardboard packaging in Norway. Traditionally a Norwegian Easter is a hollow cardboard egg reused each year. The egg is usually filled with pick and mix, and small chocolate marzipan eggs. Levegg – A wall that shelter’s you from the wind. A lot of the sunny snowy pictures from the mountains will be taken by a wall. Kvikklunsj – Basically a Norwegian KitKat, but a Norwegian will probably disagree and swear blindly that it is a thousand times better. It’s become somewhat of a mascot for hiking in Norway, and is especially popular at Easter. Påskelam – Easter lamb. At Christmas there are four main traditional dinners, at Easter it’s not as strict. Påskeski – A tradition in Bergen where a group of friends wander around the streets of Bergen with skiis on, even though there is no snow. Solo – Orange Soda. 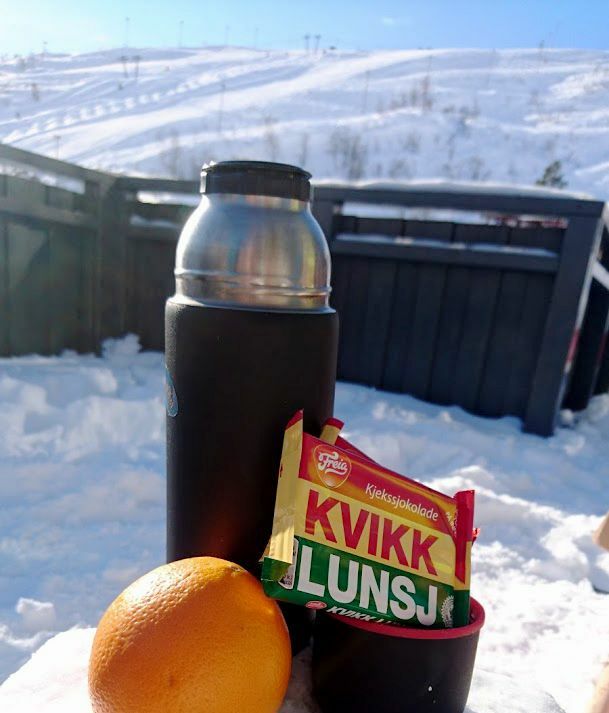 A Norwegian brand of orange soda that you take with you to the mountains.